Stephanie St. Clair was known as the "Harlem Policy Queen." In antiquated parlance, she was called "Mme. Stephanie Ste. Clair." 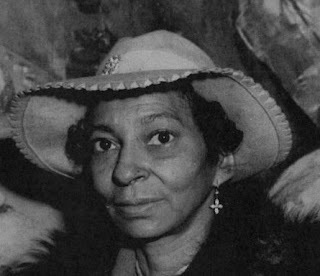 This black woman of another age was a policy banker in Harlem when that area north of 110th Street was the destination of black people migrating from the South in search of better social conditions. She is sometimes remembered as the "Tiger from Marseilles" who fought back when the mob governed by Dutch Schultz tried to take away her business interests. 1. A hardened black woman who fell for the ministrations of a kindly old white man. 2. A numbers runner who sold out her network of cops-on-the-take. 3. A fierce street fighter who stood up to Dutch Schultz. 4. A rejected, dejected wife who tried to kill her cheating spouse. Today she remains a paradox. Her life in the numbers was underground. Her life as an informant was somewhat documented. For this reason, we know more about her life after the fact -- "the fact" having ended the moment she started to talk to authorities about the underworld. Even her existing pictures are a puzzle. With the exception of one world news photo that shows her in police custody, none of her photos are substantiated beyond a shadow of a doubt. The photo subject here was identified as being the wife of Sufi Abdula Hamid. For that reason, this is most likely an image of a slightly older St. Clair. Researchers might look for ways to positively identify the providence of the few photos that exist of her. St. Clair worked as a numbers bankers when neighborhood folks controlled the policy. As a local figure, she blended in easily. She arrived in the U.S. on a Caribbean steamship in 1911. Its manifest listed her as a servant. From that humble start, she started up her policy banking business around 1922. At that time it cost a few days' pay to get started. In or around 1930, she started having trouble with the cops. Although her runners wore identification tags to indicate "no arrest," police started harassing them. Around this time, Judge Samuel Seabury, a reformer, launched a commission to investigate New York corruption. In those days New York had one reformer for every crooked cop and politician, so this didn't look like a big shakeup. St. Clair, oddly enough, was fooled into thinking that this commission could bring her cops into line. Threaten them with exposure, and they would allow her to continue her numbers. It was kind of a blackmail by proxy and it backfired on her. The commission is now a page in the history of Tammany Hall and the ill-fated term of Mayor James "Jimmy" Walker. It is worthy to note that this commission, which came to be known as the "New York City Investigation," heralded in a new "fusion" administration that blended reform and populist principles and resulted in the reign of Mayor Fiorello LaGuardia. When St. Clair visited Seabury's offices, he welcomed the well-dressed, stately woman. She sensed his empathy. He considered her complaints about crooked cops to be at the heart of his investigation into corruption in the lower courts. Police and bailiff bribes went hand in glove with the compromised criminal justice system that the commission uncovered in 1931. In going to Seabury, St. Clair abdicated her royal position in this insular, black community. Speaking to the authorities was an act that made her a figure of betrayal to the neighborhood. She had crossed 110th Street in more ways than one. After that, her precinct bag man deserted her. She was arrested by the same officers she'd once paid off. She was sentenced to a term at Welfare Island. The 1930 Census confirms that St. Clair was a resident there, living as a "work detainee." Her imprisonment was more than revenge over some precinct dirt. Her arrest had come through higher channels. It was a way to silence her violent opposition to the new numbers runners and bankers coming into Harlem. The combination, fronted by Dutch Schultz with the backing of Tammany politician Jimmy Hines, was moving in and taking over. After her release, she had a new complaint to take to Seabury. She wanted police protection from the combination in order to allow her to continue her racket. The takeover had caused other bankers to emigrate back to their native Caribbean islands. The bankers were all faced with the same choice. They could let Seabury audit their books (assuming anything was written down) or they could roll over and allow the combination thugs to bash their brains in. Those who did not leave the neighborhood would remain and work for the combination. While St. Clair made the most noise, her barrel was as empty as the frightened bankers who had abandoned ship. For now the system had moved from street corners to candy stores, from street runners to storekeepers. One banker, Paloma Lida, put it this way: "The racket is a snare and a delusion . . . now old lady Stephanie gets mixed up with the law and the grand jury. Why did she do that? Wasn't good business . . . no money in the policy slip profession; bottom done dropped out." Why did she do it, is a good question. Maybe she was too street -- she knew her neighborhood but not much else. She was Caribbean. She knew corruption, not reform politics. She was a 19th Century woman, born into a gas-lit winter, December of 1896. Why did the Tiger trust Seabury? Perhaps her righteous anger needed a righteous authority figure -- which she thought she'd found in the kindly white man who was fighting injustice. By 1932, with all of the old bankers now working for the combination, St. Clair was shut out. Her name never surfaced among the documented lists of bankers who survived the takeover. She went on to a spectacular life through her marriage to Harlem activist Sufi Abdula Hamid. Nicknamed "Harlem's Hitler" by the press, Hamid advocated the boycotting of Harlem's white-owned businesses. The marriage was not made in heaven, in spite of Hamid's affectations to spiritualism. St. Clair was eventually replaced by a younger woman in Hamid's life. Never one to turn the other cheek, St. Clair attempted to murder him by shooting at him outside his home. Having survived the wrath of St. Clair, he went on to die in a plane crash above Bellmore, Long Island, as he was preparing to testify in the trial of politician James "Jimmy" Hines. Her later years were obscure. As a black underworld woman, she wasn't fodder for justice stories or detective magazines in the way that white gangsters and their molls would be featured. For this reason, also, she was able to drop out of site. Thus, her last years are a mystery. She was mislabeled "The Tiger from Marseilles" in one book. In spite of its incorrect birther origins -- she was born in Guadeloupe -- the tag has become part of her lore. Sann, Paul. Kill the Dutchman! New York: Arlington House, 1971. New edition of same cited above. 1 August, 1938, New York Post. Ellen Poulsen, author, Don't Call Us Molls: Women of the John Dillinger Gang; and The Case Against Lucky Luciano: New York's Most Sensational Vice Trial. Lecturer and commentator on the 1930s Crime Wave. Currently completing work on a biography tentatively entitled: Chasing Dillinger: Indiana's Matt Leach Collides with the F.B.I."